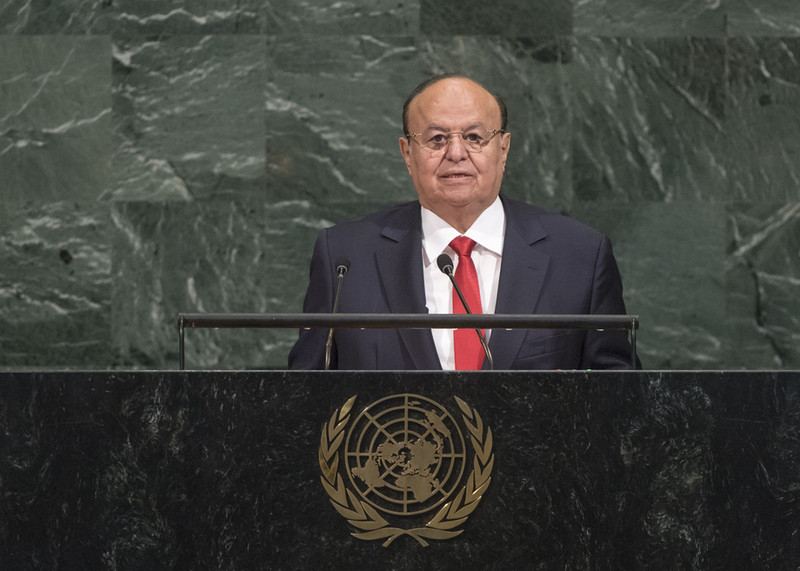 ABDRABUH MANSOUR HADI MANSOUR, President of Yemen, said his country was ending its third year of war against the Houthi coalition, which had rebelled against the political processes carried out under United Nations auspices. That coalition was evil and used violence and terrorism to rebel against the legitimate elected leadership. It had used armed force against people and taken the entire country hostage. Facing that evil, the Yemeni people had taken a stand and resisted the de facto policy of the rebels, but only after having exhausted all political, peaceful means. The rebels were implementing an Iranian expansion agenda in the region, he said, which had resulted in a request for support from the Arab Coalition led by Saudi Arabia, which had heeded that request and stood by Yemen. He said Yemen was on a quest for sustainable peace — a fair and strong peace that would lay the foundations for a real State that guaranteed peace and security for all its citizens. The Government sought to prevent violence and ensure that the State alone held the monopoly on the use of force. It would be a peace based on the consensual documents that the people had agreed upon, and that the international community had supported. The problem in Yemen was not a matter of political differences that could be managed around the negotiating table alone. There had not been a coup d’état, but rather, there was a difference in philosophies, ideologies and values. Yemenis were grappling with religious sects that were extremists and believed they possessed superiority and a right to rule. He said the rebellion organized by the Houthis went beyond any traditional military coup d’état, which sought to preserve the State and its institutions. Militias were destroying the State’s institutions, including the army and security forces, which had been replaced by militias serving only one faction. All resources had been depleted, the private sector had disappeared and school curricula had been replaced with extremist studies. The militias received full support from Iran, a State determined to destabilize the region. Sustainable peace would only be possible if Iran stopped interfering in Yemen’s affairs, creating tensions and “faking” conflicts, while stoking feelings of hatred and violence. Efforts must be made to control Iran’s expansionist aspirations, he said, emphasizing that the Iranian Revolutionary Guard had supplied the militias with long-range missiles. The rebels had refused all calls for peace, he said, had tried to assassinate the international envoy and continued to compromise peace and security, including by threatening international maritime pathways. He emphasized his desire to stop the war and achieve peace. “We are not warmongers,” he said, declaring: “We desire peace.” He affirmed his continuous quest for peace, based on the consensual agreements that had been reached, as well as those agreements endorsed by the international community, including resolution 2216 (2015). Yemen was still in need of support due to the high level of poverty and food insecurity. He called on the international community to apply pressure on the rebels to implement the relevant Security Council resolutions and to agree to compromise. His Government was ready to provide all necessary support to ensure that humanitarian assistance reached all parts of Yemen. “We want to preserve the life of all Yemenis, including those who fire bullets in our direction and target the Yemeni people,” he said. The Government continued to face the challenges imposed by the war, including the destruction of all aspects of life. The Government needed support in its efforts to consolidate peace and security, control the economic situation and counter terrorism.